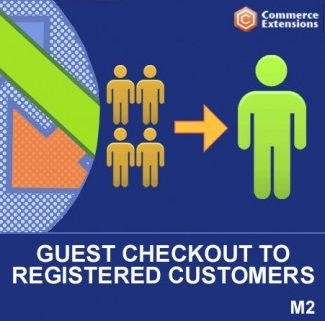 Now, you can easily convert all your guest buyers into registered customers right after the checkout procedure. 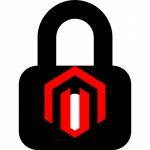 It is only necessary to install the Commerce Extensions Guest Checkout to Registered Customers Magento 2 module. And below we shed light on core extension’s features and functionality. The module allows you to convert guest orders into registered customers. Guest Checkout to Registered Customers adds a new grid where all guest orders are listed. Next, you can select what orders should be converted into registered customers. The information collected during checkout is used to create a new account. Next, the extension generates a password and sends a notification to a customer informing him or her that a new account was created. Besides, the module provides the ability to select a customer group for newly created customer accounts. Note that the Commerce Extensions Guest Checkout to Registered Customers Magento 2 module can become a great time-saver, since it offers an opportunity to run the conversion automatically. As a result, all guest orders are transferred into customer account automatically. As a Magento 2 store owner, you save tons of time and effort and get lots of registered customers. This approach provides extra motivation for the first time buyers to become returning customers. First of all, they don’t need to create accounts by themselves. Besides, they get a visualized investment into your ecommerce website in a form of the first order displayed in the account. If you provide additional motivation (such as “spend $X within 6 months and get Y discount), new buyers will likely return again and again. 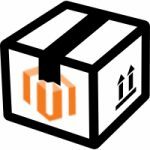 Now, when you understand the core functionality of Commerce Extensions Guest Checkout to Registered Customers for Magento 2, let’s look at its features. The extension is fully compatible with Paypal Express Checkout. Convert guests into registered users manually. Convert guests into registered users automatically. 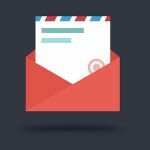 Link guest orders to already existing customer accounts (if the same email is specified). “Create New Account” button on the checkout. Assign customers to customer groups. Let’s start our backend exploration with the extension’s settings. The configuration section allows you to enable automated conversion, disable email notifications to newly registered customers, activate “Guest to Customer” button on the checkout/success page, as well as select a customer group to assign new customers to. As for the Guests To Registered Customers grid, it includes all guest orders and related data. Here, you can convert guests into customers manually. 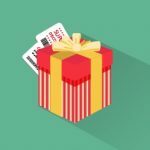 As you can see, the Commerce Extensions developer offers a reliable and powerful tool for turning guests, who are often first time buyers, into registered customers and loyal clients. The interface of the module is user-friendly, so you can easily master all its features. Another great aspect of the Commerce Extensions Guest Checkout to Registered Customers Magento 2 module is its price – just $50.